Jaguar and its sister company Land Rover have had incredible success recently. The new cars released take-off like wildfire, and as a result, JLR has had fiveconsecutiverecord-breaking months. However, some motoring enthusiasts would argue that, while the F-Type was a fantastic car, Jaguar was still missing that halo vehicle. 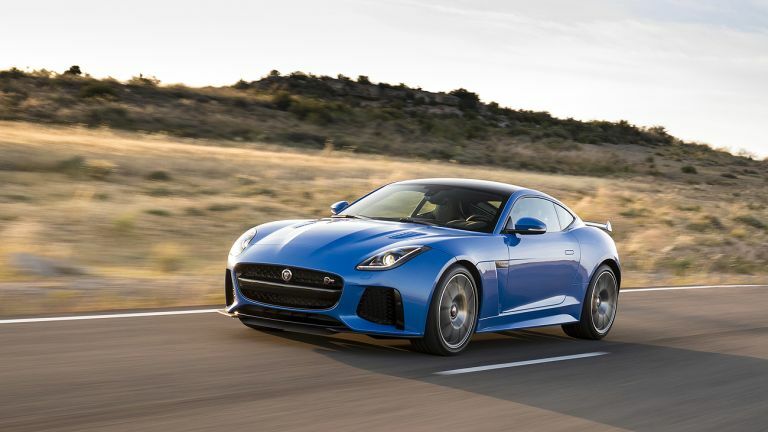 It seems Jaguar has responded, in fashion, with the Jaguar F-Type SVR. This new model has been taken by JLR's Special Vehicle Operations (SVO) division, and re-engineered for better handling, more power, and a more enjoyable experience. This isn't simply an 'add some carbon here and up the horsepower' job. All you have to do is look at the new F-Type and you'll want to drive it. SVO has taken the flagship 5.0-litre supercharged V8 which produced 542 bhp, and tweaked it, so it now produces 568 bhp. That's not all that's new however, the SVR also features an improved chassis and suspension setup, revised styling, and a new lightweight titanium exhaust (which also happens to make an edgier sound, if such a thing was possible). Being a lightweight sports car and not a tech-heavy SUV, this car isn't as feature-laden as, say, the Jaguar F-Pace. Of course, it still has a few techy tricks up its sleeve. Front and centre is Jag's 8-inch InControl Touch system. This includes music, navigation, phone, and control over some of the driving systems (including configurable dynamics). InControl runs a number of useful apps (with more in development). One of the most useful is the Remote App which allows you monitor and control your car (windows, locks, heating) with a smartphone. It's all very smart and impressive - a big improvement over Jags of the past. There's also reversing cameras and radars, but no autonomous driving aids - because, believe us - you don't buy this car to have a computer drive it for you. We drove the F-Type SVR on a mix of roads and on the Motorland Aragon Circuit in Spain, which gave us a nice varied experience with the car. What's impressive is how well the car adapts to all of these environments - in Standard mode the ride is crisp yet compliant, very comfortable for long journeys, but switch it into Dynamic and everything stiffens up and becomes more aggressive. The F-Type SVR is not only fast - 0 to 60mph in just 3.5 seconds - but it's theatrical as well. Yes, we're talking about the noise. God, the noise. If you thought the original F-Type sounded good, the SVR takes it to a next level - especially if you have the Convertible. The soundtrack through the new SVR-branded titanium pipes is an outrageous, intoxicating mix of track-bred howls, pops and crackles. Though, if you don't want to piss off your neighbours every morning, the optional Active Exhaust means you can flick it into stealth mode at your whim. Perfect. Then there's the chassis. Again, this is an area the SVO team have worked their magic on. It's now much more adaptable than the stand F-Type. Tuck into a corner for the first time and you just know you're going to be friends. The traction control will let you slide around and have fun, but keeps you from being wrapped around a tree in a ditch. The eight-speed torque converter gearbox's software has been tweaked for quicker changes, there are optional carbon-ceramic brakes (£8,000) which are a must have, and the new, larger, carbon rear wing deploys at speed. Overall, the experience is triumphant and addictive. Inside, SVO has also made a few pleasant changes. The F-Type now envelops you in quilted leather seats, contrast stitching, and features an alcantara SVR steering wheel. Jaguar has mixed the materials deftly. Leather, classy plastics and aluminium accents abound. The layout is bang-on, too – intimate and driver-focussed yet roomy, while the dash bristles with just the right quantity of satisfyingly tactile switches. You get quick access to key functions without the baffling profusion of buttons that blights some interiors. Does the F-Type SVR's interior feel like a £110,000 car, though? Perhaps not. The Jaguar F-Type SVR is an incredibly charming car, it feels (and sounds) very special, so much so it makes me sad that I'll never be able to afford one. The SVO team have worked wonders here, turning an already brilliant car into an... even more brilliant car.It's easy to live with, and easy to drive fast when you want as well. We just can't wait to see what the SVO team deliver next.